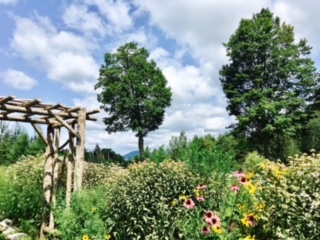 I spent this past weekend in Vermont for a 2-day environmental art therapy workshop. In the days leading up to my trip I noticed the normal feelings of excitement that go along with getting away, as well as some skepticism regarding how the material would translate to my life and work in the concrete jungle. It's natural and almost automatic for me to feel connected to nature from a mountaintop, but how would this apply in a city where a patch of grass or single tree is often at nature-y as it gets? As is generally the case, my skepticism was completely unwarrented. In addition to the grounding, expansiveness, and mosquito bites that typically accompany time in the great outdoors, I left with tangible ways to bring more nature into my work and a refreshed appreciation and understanding of the connection between environment and self. Instead of sitting in a classroom listening to lectures and power point presentations, the weekend was spent moving, creating, and connecting, engaged with the many layers of my surroundings, and in turn, the many layers of both myself, the group, and our community. In effort to keep this momentum going, here are 3 ideas to help you (re)connect with your environment, no matter where it is! - Peel your eyes from this screen, and look out your window! Pick 1 point of interest, and draw what you see. - Plant a potted plant- actually plant the roots into the soil, allow your hands to get dirty. Learn about your specific plant (watering, sunlight, etc.) and tend to it. Watch it grow! - Use 5 minutes of your lunch break to take a loop around the block. Tune into your senses- what do you see, hear, smell, taste? How do you feel? What do you notice about your skin as it comes in contact with the air? Allow yourself to expand with each step. It's Monday morning. Your alarm goes off and you're suddenly jolted from a dreamy state into complete frenzy. You race out of bed, into the shower, shove some food and coffee in your mouth, and as abruptly as you woke, are out the door for your morning commute. In less than an hour the entire weekend's relaxation and calm has been completed erased. Sound familiar? Try one of these quick-fixes to regain some grounding. On a time crunch? All take a minute or less! Pet a pooch. Studies show that time with pups leads to healthy mind and heart. Imagine a peaceful place. Not getting there? Open a travel magazine and pick your favorite. Do 15 jumping jacks. Getting out those bottled emotions feels soo good!